The Powermate LE1 can be used as a powered stair climber, a powered tailgate lift, a balanced dolly and a loading dock leveller. The LE-1 has a lifting capacity of 295kg and can be used to lift almost any bulky and heavy item up to it's weight limit. One of the LE-1 Powermate Stair climbers main advantages is the fact that the machine has two drive screws instead of one. This enables the item to move up or down the frame as required, independant of the motor used to climb stairs. 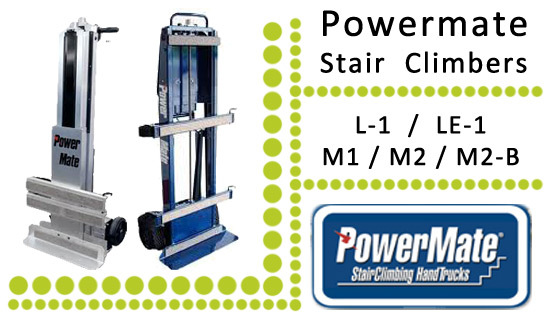 The Powermate LE-1 stair Climber is also built with hand operated wheel brakes which stop the machine rolling forward, unless the break is released by the operator.